There has been much in the news lately regarding dense breast tissue in terms of cancer risk and the limitations of mammography in women with dense breast tissue. First of all, it is important to understand what is being discussed when you hear the term “dense breast tissue”. The breast is normally composed of fat and glandular tissue – the higher the proportion of glandular tissue, the denser the breast. The denser your breast tissue, the more “white” the breast will appear on a mammogram; women with primarily fatty breasts will have a mammogram that appears darker. “Lumpy” breast tissue is not the same as dense breast tissue – density is determined by the appearance on a mammogram, not by feel. 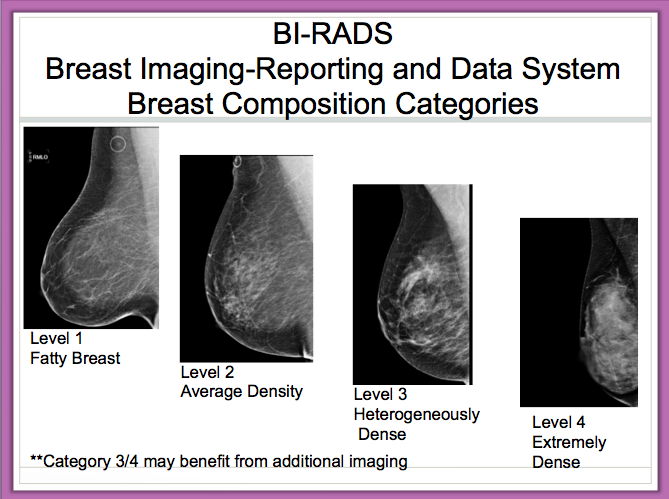 Digital mammograms are better than older film screen mammograms for evaluating dense breast tissue, and the newer 3D tomosynthesis mammograms provide additional clarity. However, all mammograms are limited in their ability to see through dense tissue and identify cancers, as cancers usually appear as white lumps on a mammogram. In general approximately 10-20% of breast cancers are missed by standard mammography – that percentage can approach 40-50% in women with dense breast tissue. Approximately 40% of women over the age of 40 have dense breast tissue by mammography. It was previously thought that mammograms simply had a harder time detecting breast cancer in women with dense breast tissue. However, it appears that women with dense breast tissue have an increased risk for developing breast cancer. This is the subject of intense research as well as some controversy, as 2 recent studies have called this observation into question.There are many factors that influence breast density including age, hormone levels, genetics, age at first pregnancy, number of pregnancies, use of hormone replacement therapy, and overall body weight – just to name a few. Younger women naturally have denser breast tissue, but that does not mean that all young women are at increased risk for breast cancer. The risk of breast cancer actually increases with age, and it is hard to sort out when the increased risk as it relates to breast density develops. Unfortunately, a woman often does not know if she has dense breast tissue – remember it is not the same as “lumpy” breasts. When you undergo a mammogram, the radiologist is required to make a comment regarding breast density in his or her report. However, patients often do not receive the radiologist’s report. Mammography performance and reporting in this country is regulated by the FDA, through the Mammography Quality Standards Act and Program, and currently it is required that patients receive a “lay letter” – a report written in layperson terms that gives a basic summary of the findings and recommendations. The lay letter does not always include a mention of breast density. If you have dense breasts, what should you do? Tomosynthesis or 3D mammography can improve the rate of breast cancer detection in women with dense breast tissue, but as there are no long-term studies, insurance may not cover this form of imaging. The amount of radiation exposure is higher with tomosynthesis compared to standard digital mammography, but is lower than with the older film screen technology. While we may be able to detect smaller lesions with these newer techniques, concern has been raised about the issue of overdiagnosis and overtreatment – we may be finding lesions that will never be of any significance to the patient. We know that breast MRI and ultrasound, including automated whole breast ultrasound can be very helpful in evaluating women with very dense breast tissue. While I do recommend these studies for some patients, there are no formal guidelines by either the American College of Radiology or the American Cancer Society regarding breast imaging for women with dense breast tissue, unless the woman is also considered to be high-risk (for example those with a strong family history of breast cancer). These additional tests may not covered by insurance. In addition, MRI and ultrasound do have some limitations when imaging dense breast tissue – there is no perfect method of evaluation. My recommendation is that women speak to their doctors. Ask if your breast tissue is dense, and if so, would you benefit from additional testing. Stay tuned for more information as newer imaging techniques which improve the rate of cancer detection in women with dense breast tissue are developed. Dr. Attai was one of the physicians invited to testify before the California Legislature in support of SB 1538, which was eventually signed by Governor Brown, requiring that mammography facilities in California inform women if they have dense breast tissue on mammogram. For more information on dense breast tissue visit BreastDensity.info.